A novel is such a large, long-term project that it takes on a life of its own. During its pre-publication life, challenges, mistakes and ironies arise to create interesting and amusing anecdotes. These pages contain a few of those, along with some writing tips for hopeful novelists along the way. READING EXPERIENCE. DON’T SPOIL THE MYSTERY. READ THE BOOK FIRST! If you want non-spoiler information on these titles, click here. Lords of the Ice Moons has its genesis in a recent paradigm shift across the planetary science community. This change in world-view (or should we say ‘worlds view) comes as a result of the discovery of subsurface oceans on several moons. Space scientists have come to realize that our outer solar system is awash in hidden oceans. Many of the larger moons circling the giant planets turn out to be ocean worlds. One of my favorites is Saturn’s famous spouting moon, Enceladus. Saturn’s tiny moon Enceladus is an extraordinary world. 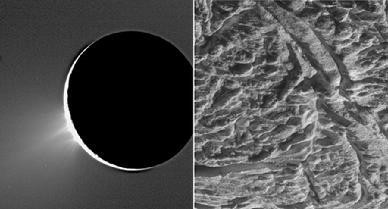 Its powdery ice surface is, in places, a tortured jumble of twisted ridges and cracked plains nearly devoid of craters. The entire moon is dusted with fresh material issuing from over 100 active geysers that tower some 400 km above the south pole. These colossal water jets are driven by tidal forces similar to those that sculpt Europa and Io. Something complicated is going on in the chemistry beneath that ice. In addition to ammonia and other life-related compounds, the ice particles in the plumes contain sodium chloride and other salts. The plumes appear to be bringing up salty ice grains from the interior. It is likely that salt water exists not far below the surface of Enceladus, occasionally rocketing into the airless sky of the glittering white moon. Is it possible that life exists down there as well? While writing an article for Astronomy magazine on the subject of “Sea Worlds”, I began to wonder what those hidden oceans might be like. Initially, we might explore them with robotic submersibles, and later with human crews, as we see in both of my other novels. But eventually, would people follow their historic pattern and set up settlements within those seas, perhaps on the ocean floor? How would we build massive structures in an ocean of eternal darkness, high pressures, and incredibly frigid temperatures? A natural solution to the construction problems on such a moon would be telerobotics, where human construction workers could erect structures remotely, using robot machinery. But in a novel, the author must humanize experience, and explore possibilities in directions that we may not want to go in reality. What if, instead of building robots, a band of scientists clones slave labor, genetically engineered to work in the harsh environment of the Enceladus ocean? It’s an idea that can “go south” very quickly, with disastrous consequences. Just what an author needs! In this nightmare scenario, I imagined a really smart construction clone, or ‘Naiad’, enslaved and misunderstood. Oddly enough, history provides a real-life analog: the Elephant Man. 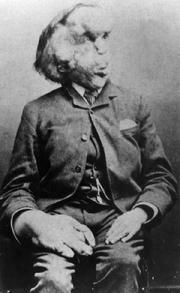 Joseph Merrick lived in 19th-century England, housed in an apartment within a hospital. Merrick was clever and intelligent, but scorned because of his appearance. We know he was visited by a certain princess, who gove him a photo (which still exists). The novel begins in that distant time, in a culture not predisposed to accept a person who is “other”. As our story progresses into our future, are our prejudices so different? Global warming: what if we had global freezing instead? What would cause such a thing quickly? In the early 1970s, several astronomers including Carl Sagan and James Kasting, studied the effects of a global nuclear catastrophe. They discovered that a series of large explosions would lead to what they called “Nuclear Winter.” An asteroid impact could wreak havoc with our climate overnight, darkening skies for years, crippling solar power and changing wind currents to render wind power farms ineffectual. Additionally, the event would change ocean currents, so another future power source, tidal power, would also be disrupted. An asteroid impact on Earth solves lots of problems for our story (though not for Earth’s inhabitants). It provides our plot with bitter cold, global energy loss, and an abandoned settlement on Enceladus. Not enough power on Earth? Let’s go back to all those abandoned settlements in the outer solar system and bring some home. Of course, you have to get around in the solar system. One concept that’s always intrigued me is a cycling ship. 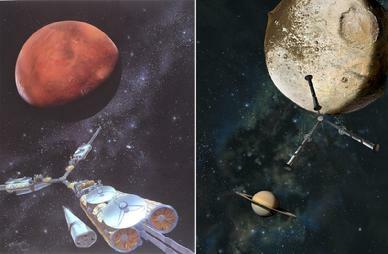 Cyclers have famously been promoted by Robert Zubrin in his Case for Mars studies, and by Buzz Aldrin in his various lunar and Mars exploration scenarios. The idea is that a ship can be sent in a repeating loop between two planets. As it approaches, passengers and supplies can be dropped off or resupplied to the ship as it goes by. A cycler to Mars travels in loops lasting about three years, but with several ships going at once, drop-offs can occur more frequently. But what about farther destinations like Saturn? The loops for a distant destination like the golden ringed world would take a long time to travel. Still, with enough ships going and coming, a cycler might make sense in some cases, especially if travel to Saturn from the inner system is a commonplace crossing. There are, of course, more efficient and exotic forms of transport, and our story includes some of these, but that’s a spoiler too far! The genesis for this novel came about in 2013 as I was doing research for my non-fiction book Living Among Giants: Exploring and Settling the Outer Solar System (also for Springer). Titan’s dramatic vistas provide a wonderful setting for a story. Its glowering skies and oily methane waves are enough to inspire any author’s imagination. In my paintings and my writing, I try to help people imagine what it would be like—on a human scale—to experience some of the wondrous places in the Creation around us. We live in an amazing place, in the midst of many amazing places. My friend Marilyn Flynn suggested the vehicle I used for the demise of our villain, Geoffrey Night. No one knows what humans might find while hiking across those methane-saturated bogs, but we can certainly guess at the wide variety of natural formations and conditions that travelers will find there. Researcher Jani Radebaugh painted a verbal portrait for me of Titan’s dunes and river valleys, and my long-time friend (and my father’s colleague) Ben Clark of Lockheed/Martin helped flesh out the details of Titan habitats and rovers. A series of trips I took to the northern cities of Alaska educated me on the challenges of living in an environment where ice is just beneath the surface. A warm house will melt through the ground unless adequately insulated, and this is certainly the case on Titan. That’s a whole other story! While writing the book, I ran across an article about the Salem Witch trials and the possibility of mass hallucinations as the result of contaminated grain. The psychotropic effects were so widespread because everybody was eating the same food. What, I wondered, might be a universal equivalent on Titan? Human inhabitants would likely get their water right from the ground, which is all water, frozen rock-solid. But sequestered far beneath that water-ice crust is a liquid ocean. What if someone broke through that natural surface barrier? What kinds of toxins might come flowing up to saturate a wide area of porous surface ice? Hence, our drilling project just offshore…and its nightmarish consequences. Living in an environment saturated with deadly, flammable gas, where everything outside looks orange, one would get tired of monochrome. Inhabitants of a Titan outpost will have posters and perhaps murals, as Kevin did. The petroglyph walls of Kevin’s apartment get their inspiration from a bedroom in my own home, where my wife Caroline and I have painted elements of petroglyphs from the Fremont Culture in nearby Utah. Undoubtedly, Titan people would cultivate plants to break the visual boredom, and this becomes a pivotal and symbolic part of the story. My local King Soopers florist Michelle helped me navigate the world of flowers. A little about titles: Sometimes a book title will be enough to get an editor’s attention (this was my experience with The Seventh Landing: Going to the Moon to Stay, my first book with Springer’s Maury Solomon). But often, the author must hold a title loosely. I wanted to call this novel “A Stranger Sea”, but the editors and marketing team at Springer felt that the internet robots would not be able to find it without some key words. So we settled on the book’s somewhat longer title. 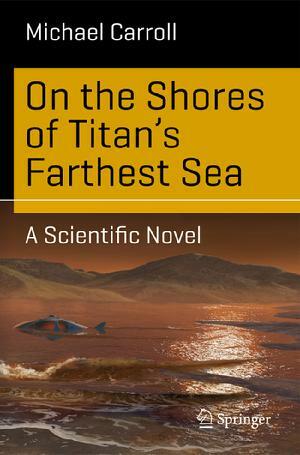 Since Titan’s seas are made of methane, Caroline thought we should change one letter of the title so that it read, “On the Shores of Titan’s Fartest Sea.” They didn’t go for it. To be good science fiction, a book must first be good fiction. My goal was to entertain, inspire, and educate, often in that order. I had many friends who gave me encouragement and input, and as always, wife Caroline and daughter Alexandra were there all along. The variety of subjects infusing On The Shores of Titan’s Farthest Sea should provide any writer with an appreciation of how important it is to face life with eyes wide open. As the great mystery writer P.D. James said in her autobiographical A Time To Be In Earnest, “Welcome experience. This means going through life with all senses open: observing, feeling, relating to other people. Nothing that happens to a writer need ever be lost.” As both an artist and a writer, I have found this to be critically valuable advice. I’ve long been a fan of Agatha Christie’s mysteries, ever since my uber-novel-reading wife (Caroline is a former librarian) got me hooked on the genre. When I set out to write a mystery on Europa, inspired by new data supporting possible eruptions there, my attention settled on Christie’s novel And Then There Were None. The story has all the classic features of a good tale of this type: a group of strangers thrust together in an alien environment, a murderer among them who must be identified, isolation at a remote location. It’s a perfect setup on a secluded island or on a distant moon of Jupiter. Christie’s story was first released in the US under the title Ten Little Indians, which was later changed for obvious reasons of respect to Native Americans. The book was originally titled Ni**er Island. At the time in England, the term “ni**er” was not seen as derogatory. Our language and sensitivities have evolved since then! I’m also intrigued by the history of war crimes in the Second World War, and the escape and eventual capture of many war criminals. This theme figures importantly in my book as well. Europa itself is an important character in the play. With its deep oceans, the exotic moon is the poster child for places to search for life in the solar system. The moon has generated enough interest that NASA, the European Space Agency (ESA), and the Russian Space Agency (IKI) have all studied Europa as a possible destination for advanced orbiters or landers. But dear reader, just imagine what it would be like to stand there, gazing across a frozen landscape with only your space helmet visor between you and that alien world! Ever-present Jupiter, always looming large in its sky, would be an intimidating and inspiring sight. And if you’ve ever walked across a glacier, you know what astonishing and diverse forms ice textures and colors can take. Europa’s high radiation environment and bizarre terrain make finding a location for human outposts a bit difficult. I devised a working map showing the high radiation provinces (some areas of Europa are more sheltered from Jupiter’s deadly radiation than others). I put our outpost in a region that has not been imaged yet at high resolution. This gave me, as the author, a little more leeway in what I could envision happening in its neighborhood. I was on “thin ice” committing to active geyser activity on the ice moon, because the only data came from several Hubble Space Telescope observations, and many were skeptical. But as the book went to press, a new observation came in that seems to confirm the activity. Whew! The idea of a EuropaHenge came from discussions with Europa expert Robert Pappalardo at the Jet Propulsion Laboratory. 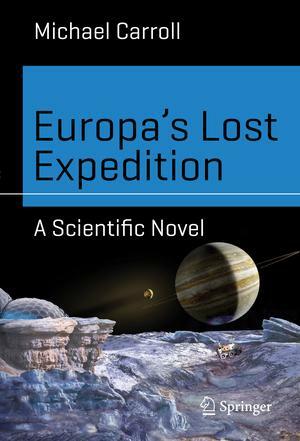 While writing my non-fiction book Living Among Giants (Springer, 2015), Bob told me that if you stood at just the right location on Europa, you could tell what time it was just by charting Jupiter’s location on the horizon. This is because Jupiter librates (bobs around) in Europa’s sky as the little moon circles it. So thought Jupiter essentially stays in one spot because Europa keeps one face always toward the planet, it tends to wiggle around just a bit. One thing led to another, and the concept finally made it to print, both in the earlier non-fiction book and this novel. It’s a fun and intriguing idea, but these scientists tend to be creative people! The simplest distillation of fiction is to create a character that the reader cares about, and give him or her a specific, attainable goal (destroy the ring in Mt. Mordor). Story happens along the way when the character encounters road blocks to the goal. But in the case of Hadley Nobile, her goal is not immediately evident. This is common to mystery, but difficult for the author. Additionally, other characters may have goals that drive and motivate them. Poor Hadley is a flawed character. This is bad for her, but good for the narrative. (Macbeth’s foolish pride leads to the deaths of Duncan and, ultimately, of Banquo and the entire Macduff family; Achilles had his famous heel, his weakest spot.) There are things Hadley wants desperately to be, but she knows she hasn’t attained them yet. Those with whom she surrounds herself embody her yearnings. For example, Dakota represents the carefree individual freedom that Hadley wishes she had (although she imagines that her own responsibilities keep her from it). The scientist in her yearns to be more like Ted, who has arrived at a comfortable balance between the purely rational and the purely spiritual. Ted’s spirituality does not compromise his scientific paradigm or research in any way. There is tension in this, and tension leads to interesting character. In fact, Ted is a bit like the author who created him, at least in this way.